I have a problem with a family with nested flanges in it. If I put the pipe accessory in the pipe I get the disconnects from the nested flanges. If I put is beside the pipe the don’t appear. Another question: how to turn of the big gray square?? You can nest the flange family into the valve family, but don´t nest it with its own connector. 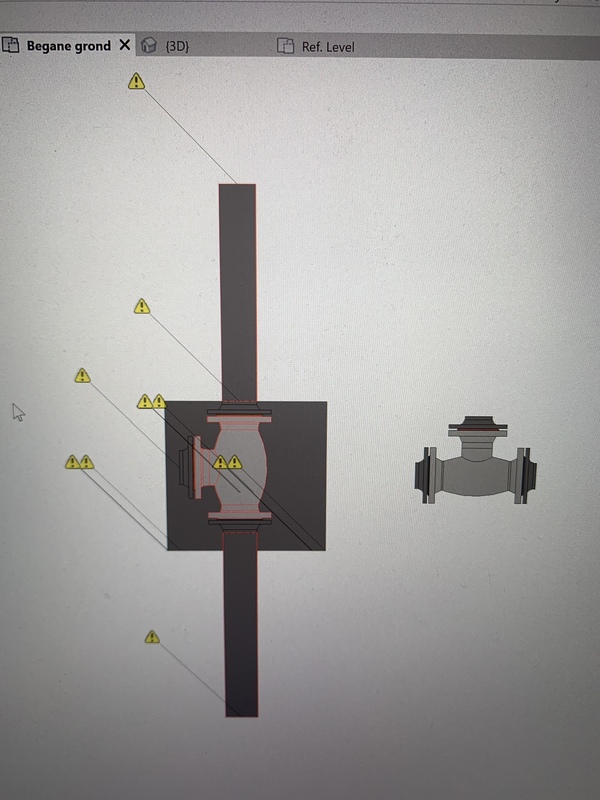 Do a new connector for each flange in the valve family, or use the same connectors in the valve, moved to the outer face of the flanges. Maybe you are nesting the flange with its own connector into the valve? That square is weird, and it seems to have 4 connectors. It is visible in plan view but not in elevations. Open the valve family; probably that element is there but hidden? The other warnings refer to open ends. I Always thought thas if you nest a family the connectors of the family you nest wil disappear. The open connectors whitch are 2 by 2 are from the flanges. Yes, nested connectors disappear and are basically useless. That's why I was suggesting to nest the flange families without connectors, and then, if necessary, move the connectors of the valves out towards the outer face of the nested flanges.